Welcome to Groundhog Day, fellow dreamers. This is my fourth sitting with Dreamers since it premiered in February 2015; Anton Lachky’s choreography has shared the stage with Jo Strømgren, Sharon Eyal/Gai Behar and now Botis Seva. The choreography has switched back to the original 29-minute iteration after being tweaked and extended last year. The last few months have seen a significant amount of change for Scottish Dance Theatre that has brought a different energy to the company: 7 out of 10 dancers are new and there’s a newly appointed rehearsal director, Naomi Murray (who was in the original Dreamers cast). The new dancers are stepping into choreography that was created for and with dancers who are no longer there; they’re inhabiting ghosts and it is difficult for me to un-imagine those who forged and imprinted themselves in their work with Lachky. 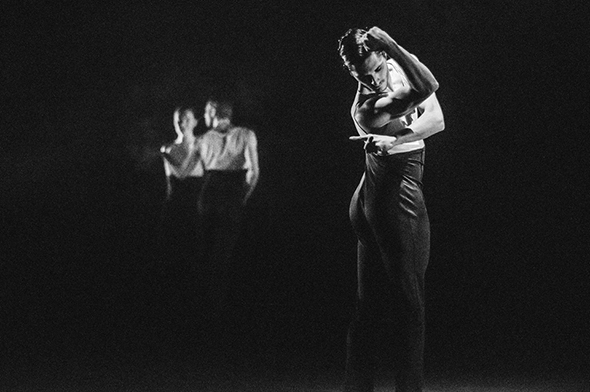 Although Dreamers has been shaved by 5 or 6 minutes, the essence of taking control and taking back control (though that phrase has been used and coloured since the EU referendum) is the same; narratively it is tighter, but the bullet sharpness and anatomical prowess from the majority of the new dancers isn’t there and consequently the difference between the vignettes isn’t as pronounced. However, new bodies fitting into old shapes can breathe something revelatory into those carcasses and James Southward (last seen in Janis Claxton Dance’s Pop Up Duets) is a fine example. An excellent addition to the company bringing an energy, presence and attitude to the movement, Southward dances everything with his whole body, hits his lines, responds and reacts to others and he draws the eye as he moves around the stage. Such is his ease with the choreography and in his relationships with the other dancers it feels as if he’s been in the company for years. However, the time it takes for a choreography to really settle on a dancer is different every time and the majority of the company has had only two months to revive Dreamers and create and learn a new work, TuTuMucky; this is evidently too little and the gel and magic isn’t quite settled yet. TuTuMucky is an invitation for the company to move differently. Scottish Dance Theatre’s artistic director, Fleur Darkin, saw Botis Seva’s company Far From The Norm perform at British Dance Edition 2016 (I too was in that audience) and commissioned Seva to make a new work on SDT. Seva established Far From The Norm, aged 18, in 2010 and he and its members have developed and refined a shared physicality, training rhythms and performance vocabulary that is unfamiliar to many UK theatre audiences. What makes Seva and his company unique is the trust and commitment to what they want to do; he has kept close control over who is and who isn’t in the company and consequently has developed a trust and communication system that enables his dancers to deliver exceptionally distilled performances. Forged ‘outside’ the subsidised dance sector, Far From The Norm is creating an alternative choreographic language that is attracting attention from London’s dance critics’ cabal, commissioners, festivals and venues across Europe. Darkin was canny to be the first to commission him for SDT and she won’t be the last. TuTuMucky offers the programme note: ‘Botis Seva defies traditional classification to offer a distinctly new form of dance that blurs the boundaries between ballet, contemporary and hip hop technique.’ Opening in dusky par-can haze we’re aware of writhing backs isolated in pools of light; with these slithery articulations Seva is attempting to get the company to move differently and unlike anything I’ve seen in the previous seven SDT productions. Shifting their energies and dropping their gravitational centres, he’s trying to school them in the hunger, urgency and articulacy of krump. Dressed in dark mesh tutus, the dancers combine a ballet-backed and first-position stiffness with the unnerving Wheelers from Return To Oz — rigid dolls hovering across the stage, mechanical in body and face. The narrative pace and emotional zoning doesn’t begin to emerge till over halfway through the 30-minute work; it feels like the dancers need to start dancing 15 minutes before they come on stage so the adrenalin is running and we are immediately dunked into their world. Until that point I saw classically-trained dancers attempting to recreate an alien, krump-inspired language. Harry Clark (trained at Rambert and previously dancing with Matthew Bourne’s New Adventures) is particularly exposed in Seva’s choreography, needing to soften his spine and to give himself over to what is being asked. I think it would benefit the dancers if they were to experience and participate in a krump battle, to drink in and taste the emotional shower that spurts from those who krump when they are entirely in that other zone. The duet between Amy Hollinshead and Southward pivots the energy of the entire work and we see Hollinshead take to krump like a cat giving birth to a fur ball, hissing and verbally banishing her ballet training to birth a new movement language on her body. The transformation of form is the root of the work: seeing bodies begin in one state, transformed to another and then resort back to their default setting. Southward revels in the intensity required and his face channels that intensity whilst his body matches the demands for articulation from his neck to his wrist. From here TuTuMucky begins to build and the electro, glitch noise soundtrack by Torben Lars Sylvest swirls the energy around the dancers and the audience; we begin to be pulled towards the rhythms, potency and urgency of the movement and I get a sense that the dancers finally start to believe; they’ve found Seva’s groove and in taking on his language transform themselves. When some dancers are able to transform and execute a new language and some really can’t, the effect is a visual unevenness that leaves me unsettled; in a company like SDT I’m left with the question of where the responsibility lies for such unevenness? Is it with Seva who has not communicated or built the necessary trust with the dancers to convince them to give themselves over to his world? Is it the rehearsal director who isn’t noticing the stark differences in the stiffness and supple spines and taking steps to resolve them? Is it the dancers who are unable to execute what is being demanded of them or do not understand what they’re being asked to do? Or is it with Darkin in her choice of bringing a choreographer who is without doubt carving a name for himself but whose language creates an incompatibility with the current company of dancers? When a choreographer like Seva is invited to make a work on full-time, salaried dancers who exist in a place of comfort and privilege it is impossible for him to recreate the conditions and terrain which he and his company have encountered and which make them so rare. The reality and experience gap is too large and consequently I feel like the two worlds haven’t come together; trust hasn’t been established and they’re still eyeing each other across the choreographic divide. 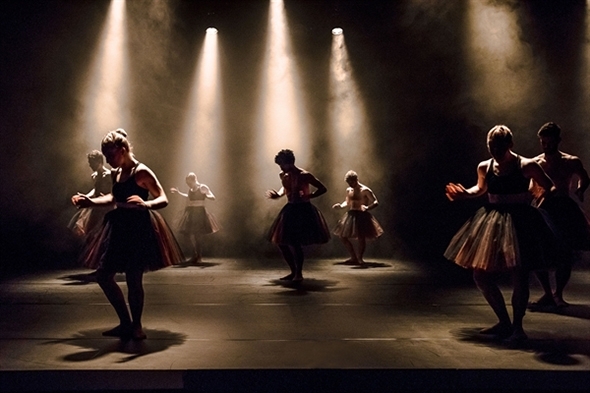 If those who encounter TuTuMucky love what they see, they should seek out the work of Seva’s own company that is offering a choreographic palette, emotional intensity and insight as to where the next wave of British choreography could be going. Anton Lachky’s Dreamers woke up last February in a Scottish Dance Theatre double bill with Jo Strømgren’s Winter, Again. Upon first viewing I struggled to see the fit as the pair were too similar — both showcasing lightness, comedy and a hyper-real quality. So I’ve come back to Dreamers to see how it has settled into the bodies of the dancers, into the company and how it sits with a new bedfellow, Sharon Eyal and Gai Behar’s Process Day. Dreamers defines itself as “making sense from nonsense and exploring links between reality and surrealism” and over the course of 35 minutes it delivers its intention well. A police line-up forms the opening image where all nine performers face front and Aya Steigman erupts from the line, fizzes with skittish urgency and delivers a hiphop-laced solo that is startling in its ferocity. This is the opening minute and I wonder whether my eyes can contain or maintain the pace. The invisible energy passed between each of the solo performers is dialled down the further away from the original source we go until everyone has had a chance or two to show us their best moves. Nothing lingers for too long and at the same time we’re not asked as an audience to invest much either; we see two or three playful examples of what the world might look like if the choreographic power is given over to Audrey Rogero and Francesco Ferrari. The strongest visual memory from my first Dreamers was the face-melting elasticity of Rogero and 12 months on, the malleability, facial contortions and impossibly extended neck stand out again as she out-Doyles Mrs Doyle. Slapstick, physical buffoonery and bodily control are re-employed again and again with Rogero manipulating the remainder of the company at her whim; spinning, flicking, and boot-camping them. As she discovers her power and ability to transform she gifts us one of the most infectious cackles heard on stage. When Ferrari emerges from the pack to take control, he’s barking orders ferociously in an unknown language and basking in the power of controlling the others — apart from when Amy Hollinshead marches out of the line like a rebellious tin soldier, frustrating Ferrari even more. The lightness and humour shines alongside the musical choices of Bach, Verdi, Chopin and Haydn. Dreamers is a white, crisp, and frothy demonstration of personality, wild abandon and fine dancing. As night follows day, dark will follow light and Process Day now follows Dreamers. Are we in Dundee or have we been transported to a Weimar Republic cabaret, a dark world filled with luscious, crepuscular creatures, a place where gender is dissolved and eyes linger on the smallest of details? Eyal and Behar, alongside Ori Lichtik (musician), Rebecca Hytting (assistant and co-costume designer) and Alon Cohen (lighting) create an unsettling environment that either repulses or embraces the eyes that rest on the stage. Clad in black from foot to ribs and a neutral scrim from the chest upwards, the dancers exist in a quarter light giving the impression of a floating set of torsos and amplified arms which frame and isolate each other like a vogue ball. From the nine performers, Josh Wild (apprentice dancer from London Contemporary Dance School) is a choreographic leech, creeping onto other performers, intruding and creating a series of unwanted duets before blending back into the dark. The dancers seem almost extra human and there’s a striking motif of Matthew Robinson’s controlled head-butting of Jori Kerreman’s stomach – it fits perfectly in this world and is one of the many lingering frescoes which sit amongst the larger-scale ensemble moments. Cohen’s lighting design aligns well with the choreographic intention; despite the lights being so dim I am noticing the slightest of movements: twitches, ankle rotations and shoulder snaps were pulling my eyes all over the stage as a thin film of haze weighs heavily on the stage. Classical strings, abrasive bass and relentless synths offer a sonic realm that promotes difficulty. Choreographic difficulty is also on show as not all the dancers are comfortable with this hard, sinewy performance style. Eyal and Behar are a brave choice from Artistic Director Fleur Darkin as they’re asking the dancers a completely different set of choreographic questions from those of Damien Jalet’s Yama, Darkin’s own Miann or Strømgren’s Winter, Again. I am sucked into the world of Process Day by the scenographic control that Eyal, Behar and their collaborators have over me. It is satisfying to spend 40 minutes with them in their world of heavy and dark; but if the company does with Process Day what they did with Yama — extending it from an original half bill to a full-length work — now that would be a 30th birthday present worth unwrapping.